Ivomec Eprinex® is the most potent parasite control product ever produced. Only Ivomec Eprinex® is more than 99% effective against 11 economically damaging internal parasites, including the brown stomach worm. Ivomec Eprinex® is more than 99% effective against 12 damaging fourth-stage immature larvae. Ivomec Eprinex® wipes out the larvae before they're old enough to lay eggs. 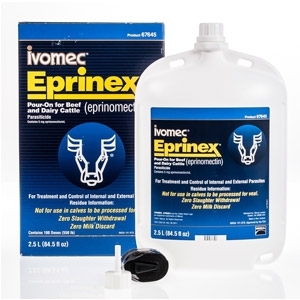 Ivomec Eprinex® kills a broader spectrum of parasites than any other pour-on. And it controls biting and sucking lice.